The Boston Globe ran an article yesterday about bookstores connected with libraries. 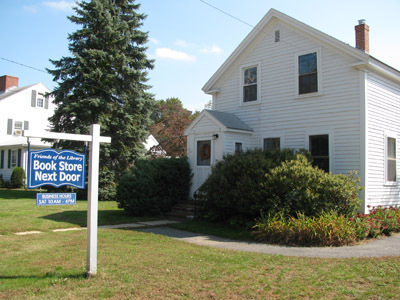 The Book Store Next Door, run by the Friends of the Wilmington Memorial Library, is cited as an example. TBSND brings in funds for the library, and it’s a great place for community members to pick up cheap used books as well. Plus it’s in a charming little house – definitely worth a visit if you’re in the area! Photo courtesy of the Wilmington Memorial Library. A longer post about the process of weeding in libraries – i.e. getting rid of books – is in the pipeline. i think i’ll be in the area!